Sunday, 20th of August, 2017, the Kapuso Primetime Queen, Marian Rivera-Dantes posted a screenshot photo on her official Instagram account. On her said Instagram post, she clarified that she doesn't have a Twitter account and she doesn't know who's the person using her identity, with a username @superstarmarian on the Twitterverse. Marian Rivera and the fake account's tweet. She also appealed to the fake profile to stop using other people's name. FYI: Wala po akong Twitter account, hindi po ako si "superstarmarian" sa twitter at hindi ko rin kilala ang taong nasa likod nito. At sana tumigil na ang ganitong mga account na gumagamit sa pangalan ng ibang tao. As of now, the poser of Dingdong Dantes' wife changed its Twitter name to "Fake Marian Rivera‏" and reacted to one of its bashers. 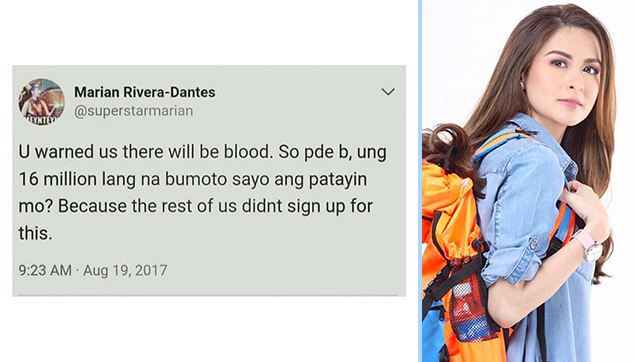 According to GMA News Online, Marian Rivera-Dantes wants the parody Twitter account of @superstarmarian to be taken down, because of the negative effects to her family.